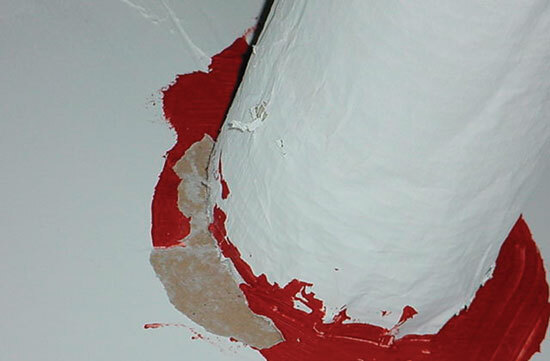 For its firestopping issue, Insulation Outlook asked Jerry Heid of Zero International, a manufacturer of intumescent materials, to speak with those on the front lines of firestopping – an engineer at Underwriters Laboratories, a fire marshal and the president of a firestop consulting firm – and pinpoint the issues most important to firestop installers. Today’s building and life safety codes recognize the vital role of passive fire protection systems for preventing the spread of fire, smoke and poisonous gases, buying time for safe evacuation of occupants and helping protect firefighters. The codes are clear that fire-rated walls and floors, when breached, must be firestopped to restore their original design integrity. While the building industry debates proposals mandating the use of certified specialty contractors for this critical life-safety application, the reality remains that insulation contractors often find themselves on the front line of firestopping. Regardless of who drilled the hole, insulators working across the trades in practice can end up owning the breach and responsibility for closing the opening. Properly installing tested firestop systems to maintain fire ratings demands understanding and precision. With life safety at risk and plenty of liability to go around for performance failures in a fire, application mistakes can incur costs far beyond what it takes to remedy failed inspections. When it comes to firestopping installations, being forearmed with knowledge beats dodging bullets every time. Using approved specialty firestop contractors is without question a prudent course for construction managers and owners. The Firestop Contractors International Association (FCIA) offers contractor education and certification through Factory Mutual (FM) Research acting as its qualified testing agency. And FCIA continues to advocate for incorporating its FM 4991 installer certification standard into master specifications. 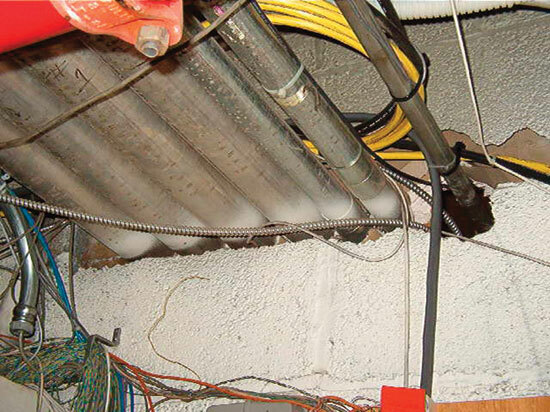 For insulators faced with responsibility for firestopping on the job – and for those considering certification – this article highlights some of the major code and enforcement issues that can have an impact on planning and firestop application. For that purpose, we have assembled a team of industry professionals who offer insights reflecting their various expertise in manufacturing, testing, enforcement, inspection and consulting to firestop standards in both the International Building Code (IBC) and National Fire Protection Association (NFPA) 5000 model building codes. Municipalities across the nation are in the process of adopting one or the other of these two codes. Both codes preserve firestop requirements already established and enforced under all current major codes. Richard N. Walke is staff engineer for the Fire Protection Division of Underwriters Laboratories. As head of the architectural services group, which provides services and information to users of the UL directory, Walke often speaks to industry groups and presents educational seminars on fire protection issues. Prior to his current assignment, Walke was involved for 17 years in the testing of hourly fire-resistive assemblies, including firestop systems. Karl K. Reynolds is fire marshal for the North Naples, Fla., Fire Control and Rescue District. Throughout his 19 years on the job, Reynolds has espoused a highly proactive approach to both firestopping inspection and education. He sees ongoing education as the key to solving the three biggest problems he observes in firestop applications: 1) lack of formal training; 2) installer difficulties in reading tested assemblies in the directories; and 3) not following the specifications. The Florida Building Code, which is currently based on the Standard Building Code (SBC), will adopt IBC as its base in early 2005. John Sinisi is president of Firestop Inspector LLC in Manasquan, N.J. Sinisi’s firm provides a full complement of consulting services intended to optimize firestop planning, application and inspection. These services include: plan review and site surveys to identify fire barrier breaches; forensic investigation for the same purpose for renovations; barrier documentation and labeling; inspection and verification to ASTM standards; training and education; and expert testimony. Sinisi also offers third-party inspection services. 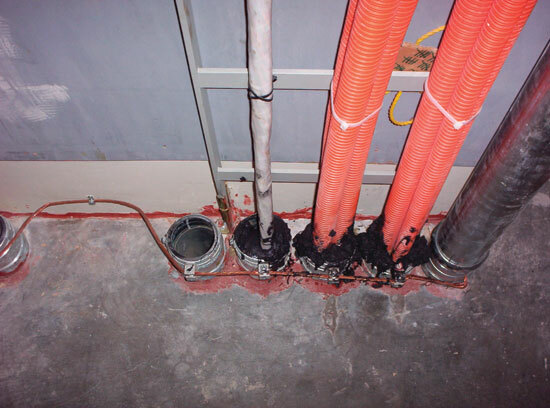 Here are some issues these experts have found to be especially important to firestop installers – and their advice to insulation contractors who have to manage them in their installations. The fundamental requirement for firestopping established by IBC 2003 Sections 712.3.1.2 and 712.4.1.2 is using tested and approved assemblies and methods. All requirements for maintaining assembly ratings are detailed in directories published by UL and other testing agencies. Walke notes that listings in the UL fire-resistive directory include basic layouts with detailed explanations of configurations, conditions, and installation parameters and procedures. The hourly ratings included in each system apply only to the complete system, constructed and installed as specified in the system. The individual components are not interchangeable between systems. What this means to firestop installers in practical terms, using familiar examples provided by Reynolds, is that caulking at the intersection of a ¾-inch pipe in a ¾-inch hole is not acceptable. If the caulk is not inside the membrane, it will expand outward in a fire and fall off. On the other hand, approved systems covering plastic pipe greater than 2 inches in diameter typically include intumescent wrap strips applied in a specific manner, with a metal collar to direct expansion inward as the pipe softens, attached with approved anchors to the bottom of the slab and using hose clamps or screws to close off the collar. Or an approved tuck-in system might be used with wrap strip placed around the pipe, held in place with wire or aluminum tape, and then pushed into the opening. Intumescent caulking in a prescribed manner to a specific depth might be approved for certain applications. In all cases, the hole must be drilled larger than the pipe, and the allowable size of the annular space varies by tested system. Reynolds also points out that industry strides in minimizing required product volume make the need for precision in firestop installations even more urgent. Manufacturer specifications may not cover all necessary installation details, so Reynolds requires contractors in his district to take copies of tested assemblies from the directories and provide them to authorities having jurisdiction (AHJs). The documentation serves as reference for both installers and firestop inspectors. He advises contractor superintendents to keep assemblies on file with copies in each service truck and at each job site. Reynolds devised a notebook specification system that has been in place in North Naples, Fla., for more than five years. "Installers usually end up using the same three to five assemblies for each kind of penetration – concrete, drywall and wood frame," he said, "Keeping those assemblies permanently on file probably covers 90 percent of what you will find in the field." Reynolds emphasizes the vital role of education for understanding specifications and properly installing firestop assemblies. He explains, "Firestopping can only be enforced to the level of the AHJ’s knowledge of the codes and specifications for the tested assemblies. To ensure that everyone is on the same page, we start by educating the AHJ in both the fire service and building departments. Here in Collier County, the Fire Marshals Association has been providing seminars for both the AHJs and contractors to learn about the proper installation of firestopping together at the same time. This way everyone hears the same thing, and it helps to bring the industry together." For any contractor installing firestopping, knowing what the AHJs expect is essential. If your fire district does not provide a similar education program, it makes good business sense to ask for it. The International Firestop Council (IFC) also provides training for this purpose. In addition, ask for pre-construction meetings with the AHJs. Sinisi notes, "In new construction it is important to extract a schedule of issues to be ‘repaired’ from the design prints. This list provides the basis for inspection and statistical analysis throughout the project. Also recognize that ‘unplanned’ openings of fire-rated walls and floors on the construction site are common. If the print calls for a 2-inch hole to be drilled, and the carpenter has a 4-inch bit on his drill, you may have a modification made in the field that requires a change in repair system selection." Virtually every job will include some unusual penetrations or requirements for which tested assemblies do not exist. In addition to unplanned openings and change orders, perhaps someone simply changes a pipe. Or a renovation reveals an odd configuration of pipes. If there is no specific test for that specific situation, you will need an engineering judgment acceptable to the AHJ. The best time for identifying the need for judgments is during the development of plans. Walke observes, "Ideally, architects should identify and resolve all firestop issues, including necessary judgments, as part of the submittal package to the municipality. More often it’s caught during inspection – leading to delays." As best practice, contractors should ask during plan review if any engineering judgments would be needed. Factor that information into your bid price and scheduling. Ask the manufacturer for an engineering judgment, which is often acceptable to AHJs. If the AHJ will not accept the manufacturer’s judgment, the manufacturer, contractor or architect should then request one from the testing agency. The agency often uses the manufacturer’s submittal as a starting point and documents the judgment in a letter outlining any exceptions and attaching a drawing. Keep in mind that engineering judgments are issued for specific penetrations on specific jobs only and are not transferable. The IFC publishes guidelines for engineering judgments, which are recommended for installers’ reference. Walke identifies other issues that may constitute obligations for firestop installers even when solutions or code requirements are less than clear. To the first point, he advises that IBC and NFPA 5000 both require T ratings equal to floor ratings for all firestops through floors. 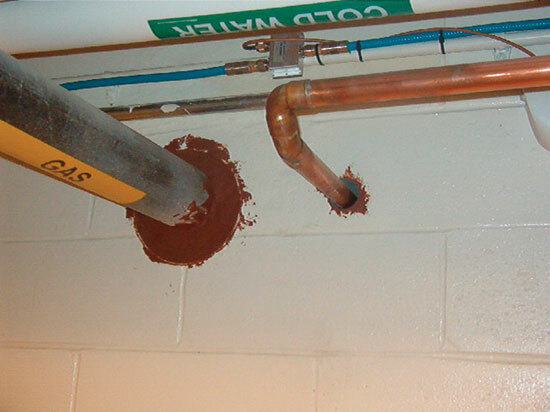 This is difficult to achieve for metallic penetrations because of the thermal conductivity of the penetrants. The 2004 UL directory includes various systems using thermal insulation, such as fiberglass or mineral wool, to achieve these ratings. However, these systems will not work for copper pipe conduit for cabling, which generates heat that cannot dissipate normally when insulated, potentially leading to hazardous overheating. The National Electrical Code, NFPA 70, addresses the need for "ampacity derating" in conduit using tests for determining what reduction in current load is needed to maintain temperature within acceptable limits. However, manufacturers have not done much testing to this standard. Although some AHJs are overlooking this issue, until tested solutions become available Walke encourages firestop installers to plan ahead and protect themselves by raising the issue for discussion with AHJs. A similar dilemma for contractors comes out of IBC (Section 710.6) and NFPA 5000 [8.10.4.2] requirements for preventing the passage of smoke when non-fire-rated smoke partitions are penetrated. "No published UL systems currently exist," says Walke, "so contractors end up on the line making judgments about what is needed and how to resolve it. Your options here are to install a fire-rated system in the non-rated wall – and that will probably be acceptable to AHJs. Or push for manufacturers to start testing systems for that purpose." In other areas, contractors can have implied and legally enforceable obligations that exceed explicit code requirements. Walke observes, "Smoke migration through a building during a fire is responsible for many deaths. UL developed an L leakage rating for firestops approximately 12 years ago." The L rating, which provides quantifiable measures of performance, remains optional. Although industry efforts to add the rating to the building codes have met resistance due to cost concerns, the codes still contain generic language requiring contractors to install systems with low smoke leakage. Walke reminds us that the legal standard of responsibility is always to the highest available level of life safety, regardless of code requirements or omissions. There are rated systems available offering low smoke leakage, and he advises contractors to select those systems to meet the higher standards of performance. Reynolds tells contractors to check their work using the same methods the firestop inspector will use. In Collier County, Fla., he requires inspectors to use flashlights for good visibility in unlit interiors, and they use ladders and mirrors as needed to be able to see the top of each penetration to confirm adequate caulking to meet the specs. Using standard sampling procedures and engineering practices defined by code, Reynolds’ inspectors conduct selective destructive testing to confirm compliance with firestop requirements. He explains that it is necessary to probe with a knife "to confirm that caulk and wrap strips have been put into the annular space, they have minimum space, and they have not exceeded the annular space around the penetration." Inspectors also tap on backfilled, abandoned holes using hammers or knives to listen for telltale signs of improper backfill materials, such as newspaper or batten insulation, used in place of the required nonshrink grout. He prefers to see installers use tested assemblies for abandoned holes. 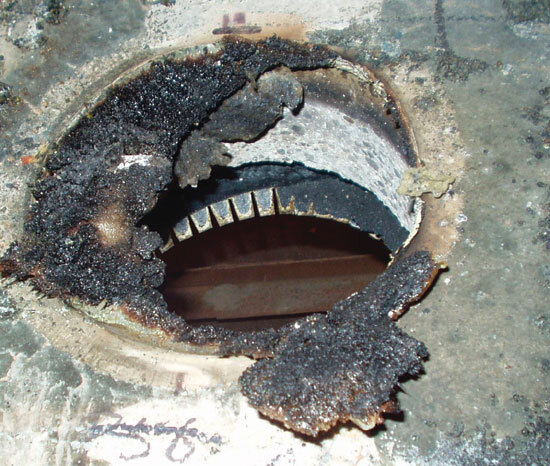 When inspectors find a bad installation on the first sample, you can expect a lot more destructive testing, and often it is necessary to redo all. Reynolds asks contractors to be present during inspection and patch "as they go." Also commenting on inspection methodologies, Sinisi explains, "Verification of all installed systems to a specified tested system drawing is the best method to assure compliance, but is impractical for most jobs. Although it is impossible to inspect every penetration and joint system on a project, random sampling techniques supported by industrial engineering principles and documentation can help guide the inspection. 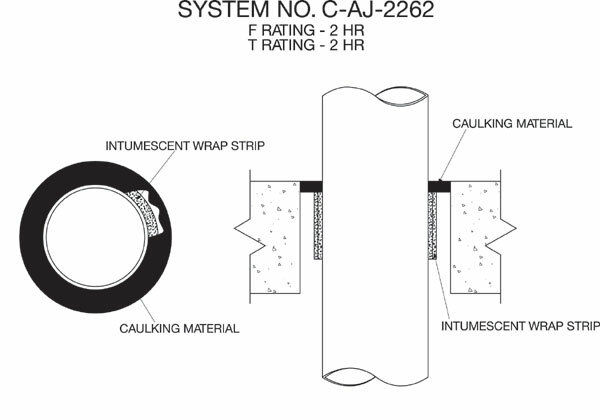 ASTM E2174 (Inspection of Installed Firestops) provides standard statistical techniques for assuring installed system confidence. All require a schedule of systems to be inspected and inspection zone square footage to be predetermined. This is possible on new and existing buildings by employing a standardized method of documenting openings in your rated walls and floors." Third-party inspectors such as Sinisi’s firm are available to assist municipalities lacking the expertise or time to follow the example of Reynolds’ district in inspecting firestops to those standards. Walke points out that firestop contractors and the FCIA are promoting code provisions for third-party inspection, similar to requirements already in the codes for inspections of fireproofing for structural steel. Sinisi notes that contractors can themselves benefit by employing third-party inspectors for independent verification of installed systems. "Where AHJs inspect to code," he said, "third-party advice can help installers demonstrate adherence to best-available standards and methodologies." 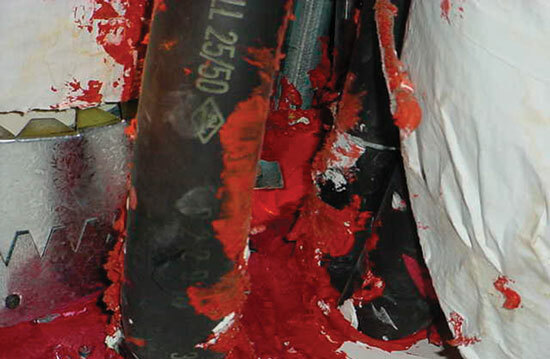 Reynolds offers several examples of common installation mistakes that cause firestop inspection failures – and accrue high risk of performance failures during fires. "Fire caulk spread two to three inches around the penetration is a red flag to inspectors," he said. "That usually means the annular space exceeds the specified maximum. Using a hammer to make the opening blows out the inside of the drywall, which makes it impossible to meet tested specifications for either caulk-only systems or intumescent wrap strips. Making the hole with the appropriate-size drill bit will make all of our jobs easier." Reynolds cautions against mixing different caulks in the same hole, using different types of caulk on each side of a penetration, and cutting wrap strips lengthwise to "economize." None of these uses conforms to specs for tested assemblies; manufacturers will not back them; and inspectors will reject them. Walke advises close attention to the proper placement of wrap strips in tuck-in applications in floors. If installed at the top of a thick floor slab, the intumescent material will be shielded from heat during a fire, potentially delaying or preventing its activation. "Be careful to install as specified," he said, "and understand that there are consequences if you don’t follow the details." Curtain walls are especially difficult to protect, so Reynolds advises following specifications precisely. Pin tabs holding installed fiberboard must be placed at specific intervals. Inspectors will also look for required compression in the fiberboard inserted at the slab to fill the rest of the opening. 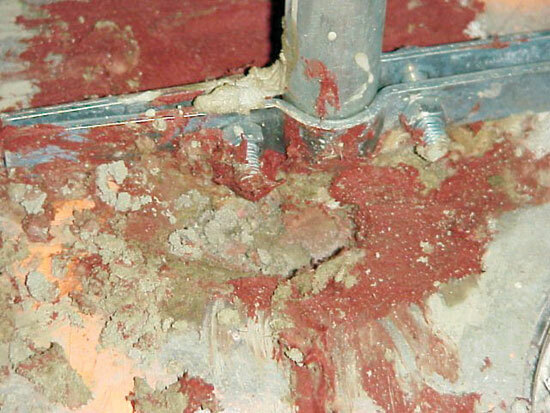 AHJs will inspect these installations at each of three stages: 1) cross bracing and pin; 2) fiberboard installed with compression; and 3) application of spray-on or elastomeric product. In the end, it all comes down to following those details. As Sinisi concludes, "Know and understand the firestop requirements before you start. The size of the opening is part of the system; so be prepared to drill a hole to the specified width. Know the specified systems and how to install them. Go in with a plan and stick to it." The passive fire protection industry has provided many practical tools and guidelines to help installers firestop cost-effectively, ensure installation quality and limit their liability. With so much at stake, however, all our experts agree the safest, wisest course is using certified contractors for firestopping. For insulation contractors on the front lines, their best advice is: Consider getting certified yourself – or designate someone on your team to specialize and become an expert in the complexities of firestop requirements and installation. 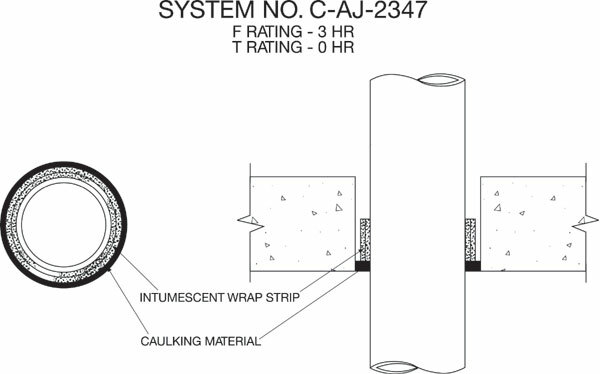 Firestop Systems C-AJ-2347 (Figure 2) and C-AJ-2262 (Figure 1) published in the UL directory are typical tuck-in systems with wrap strip installed around the pipe and caulking material applied at the slab. Installed from the bottom of the slab, systems such as C-AJ-2347 offer better fire performance than System C-AJ-2262 and other systems installed from the top, where the top of the assembly may delay or prevent the activation of the intumescence. Drawings courtesy of Underwriters Laboratories. Using drywall screws to anchor the metal collar of this firestop system is not acceptable to AHJs. Photo courtesy of Karl Reynolds. Caulk widely spread out from the base of this insulation raised a red flag for inspectors. Drywall skin peeled away during destructive testing, which revealed annular space that is too small for the firestop insulation. 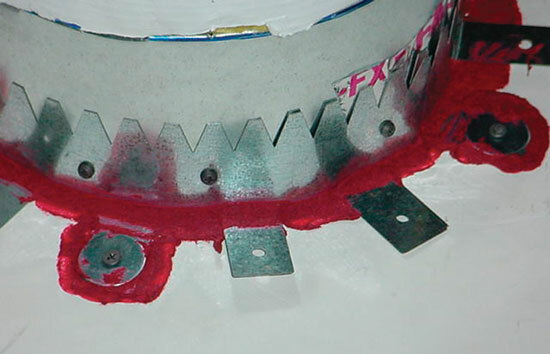 The hole has to be drilled larger than the penetrant up to the allowable maximum for the annular space. There is no way to repair an opening with multiple penetrants. In this example, the installer attempted to do so using a large amount of caulk, which caught the attention of the inspector. A mixed multiple penetration, as shown, requires an engineering judgment for firestopping acceptable to AHJs. Photo courtesy of Firestop Inspector LLC. 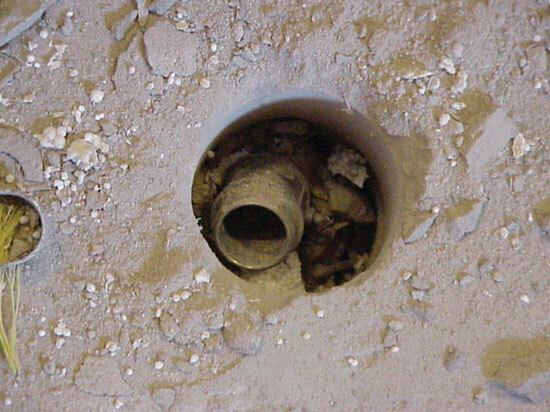 The 2-inch pipe shown at right replaced a 1/2-inch pipe as a result of a change of order. However, the installer failed to replace the original firestopping. The firestop system for the pipe at left is correctly installed. Improper installation caused this assembly to ignite non-fire side leading. The plastic pipe was consumed by flames, essentially leaving an open hole in its place. Photo courtesy of Underwriters Laboratories. Inspectors use hammers or knives to tap on backfilled holes to listen for telltale signs of improper materials, such as trash stuffed in the hole before topping off with nonshrink grout. Tested assemblies should be used for abandoned holes. The perils of working without a plan for repairing breaches are evident in this view of annular space in floor penetrations filled in with roofing tar. This installation mixes foam and two different caulks in the same hole, which does not conform to specs for tested assemblies. 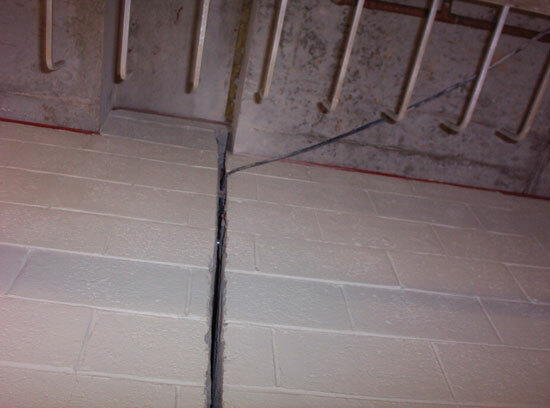 As a result of a specification error, a contractor firestopped only the horizontal gaps in this fire-rated wall, leaving all vertical gaps exposed. 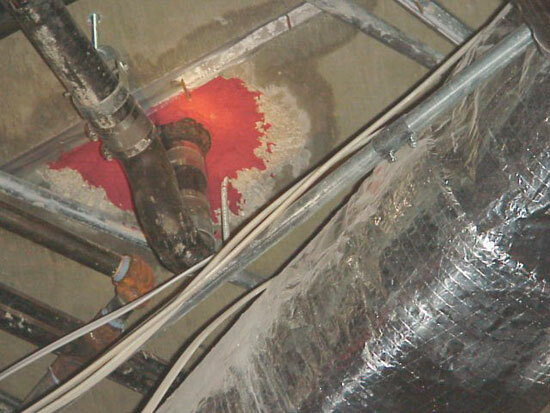 In this example, the excessive spread of red caulk alerted inspectors to a hole size that exceeded the allowable maximum for the annular space.